To set the stage… As part of the conclusion to my keynote at the University of Western Ontario LME Conference back in May, I made two general but connected observations on the international Sistema movement. The first of the two highlighted an issue many of the privately-funded Sistema initiatives face: with annual or similar short-term funding windows, these start-ups often find themselves compelled to demonstrate some kind of positive outcome very quickly in order to justify renewal of support. As a result, their first target becomes technical proficiency – if nothing else, their participants will sound decent. This isn’t a problem, and I was careful to say as much. The fact of the matter is that the social consequences of this choice are not known, simply because the exact, specific relationship between music and social change isn’t understood. It’s comprehended conceptually, but there isn’t as yet a prescription to follow like “take three years of violin in an orchestra that rehearses Tchaikovsky four times a week and you’ll have better life outcomes.” But it does mean that programs in their early stages frequently judge their success only by how good their kids sound, which has in turn led to some reprehensible statements like “my kids play so much better than their kids” from some ill-informed individuals who have completely missed the point. There is one outcome which is unequivocal, in my experience, and this is where I waded up to my neck in controversy. I stated that the corollary to making technical proficiency the first target was that it made musical literacy the first casualty. I said this phenomenon was universal, and was present without exception in many Sistema programs with which I had worked or consulted. I’m not going to cite chapter and verse of my experiences in this area,nor am I criticizing the students or faculty in the least. Teachers in some programs are trying interesting new approaches, although with limited results. 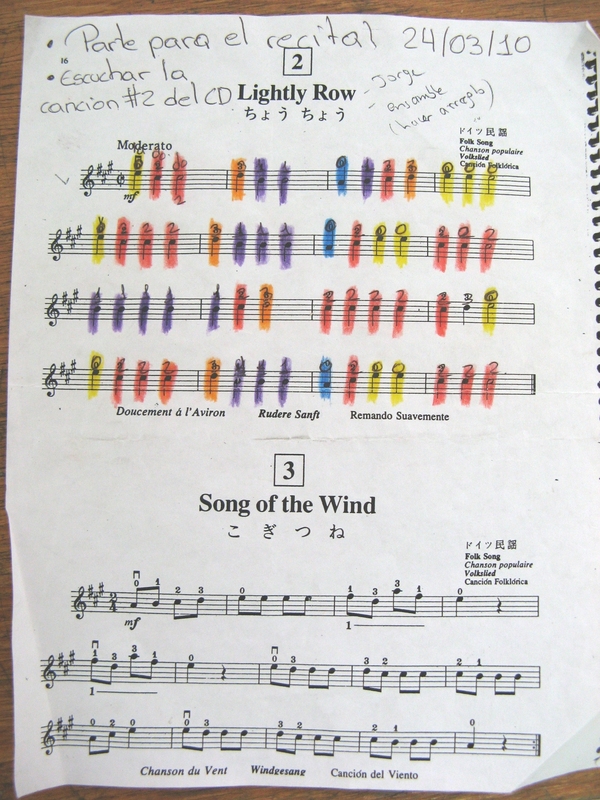 The fact is that music notation is an incredibly complex symbol system, and the students actually show great intelligence by addressing its challenges in the simplest way possible: learning the music by ear/rote. (Easy to do with high frequency!) Memorization of the repertoire sounds impressive, but without the flexibility or the capacity to change or correct, it’s largely meaningless. And of course, you run into hereditary C-naturals, handed down by generations of clarinetists in defiance of all harmonic or tonal sense. Musical literacy remains a major point of contention in music education, and the moment the audience in London had a chance to push back, I was assailed from all sides with arguments against it in the form in which I had defined it. I don’t actually dispute any of the points or counterpoints made: what we teach and how depends greatly on the musical genres chosen. My point is that if you wish to engage in a genre which is without exception encoded in western classical music notation, real literacy in that symbol system is probably a good idea. There may be social consequences in this situation too – it may be that learning how to read music is an integral part of the struggle. It may be that those students who cannot climb that pedagogical mountain learn to fake or drop out – or both, once the level of musical difficulty becomes too high. But when we talk about empowering individuals, engaging them in a lifetime of independent learning, we invariably and very reasonably talk about the value of literacy. There is so much knowledge and beauty encoded on a printed page, be it in letters or neumes, but all of it remains inaccessible to those without the training to read and comprehend it. At this point, I’m content to leave the matter unresolved, citing “insufficient data.” It’s important to keep in mind that musical excellence isn’t the point. Pursing it is, but it can be pursued in many different ways. I really enjoy your writing. The questions are important and it’s good to name the issues so we can think and discuss them. Thank you also for taking the “tiger mom” issue by the tail. The way I see this is that El Sistema nucleos have two major goals: one long-term – to develop musical ability and to enjoy music making, and the other – also long-term — to change the worldview and the mind habits of underprivileged children, to empower them, and to increase their self-confidence. The confusion is on the part of those who think that after one year results should be obvious/expected on either goals or that only hard evidence will move donors towards continuing support. For both goals it’s too soon to measure any outcomes given how young the El Sistema movement in the U.S. is, which is why I would say that even your concern that musical literacy might get sacrificed may have come too soon. Just wait and see. In eight-ten years you may conduct a group of musicians coming from an El Sistema-like nucleo who may have no problem reading, performing and changing the C-flat in a beautiful, musical way just like the conductor wants. I personally think that music notation education should be started as soon as possible in music programs, simply because it is just like any other language – the earlier you learn it and get immersed in it, the better you get at it. There are many ways to get to the same destination, especially in an activity like music which involves body and mind so deeply (shouldn’t see them in a dichotomous way). It just takes time. Once I was driving through a small town in Illinois and saw a message at the entrance of a church: “This is how children spell LOVE: T-I-M-E.” El Sistema and other similar programs are ultimately about love. I think it takes a bit of courage to ask some of these questions in an environment that is filled with opinions. I concur, your writing on the subject of El Sistema is insightful and I am so happy to have stumbled upon it. I recently spent a few months in Venezuela studying El Sistema. I found the program of study to be quite comprehensive (at least on paper). A major difference between US “start-ups” and established nucleos in VE is that they demand that students participate everyday except for Sunday. We are often afraid to ask for such a commitment in the US citing homework, transportation, bedtime, and other such concerns as reasons not to require lengthier time periods for study. As such, VE students have more exposure to playing and reading whether it occurs in the private lesson room, sectional rehearsal, large-group rehearsal, or language of music class. I believe that music notation reading is essential. Having taught pre-school-age, primary, elementary, secondary and special needs music programmes I KNOW that notation reading when taught as part of ear training is easily learned and absorbed as a basic part of the musical skills package. Orff Schulwerk pedagogy can help set up the motor skills that must be combined with visual and aural skill sets. The notion that Suzuki repertoire must be taught exclusively by ear up to and including book 5 or 6 is silly. I am also a handbell ringer and have recently started an elementary school bell choir which proved (yet again) just how quickly 10 and 11 year-olds with little or no musical background can turn into competent, enthusiastic, happy musicians. As notation is a visual representation of what we hear, it is essential to teach reading as part of ear training instead of as ” instructions for fingers.” It is so important to get the music off the page and make it live with expression. Failing to teach notation reading skills is inexcusable and can only limit anyone’s progress, child or adult. I have seen the opposite phenomenon around me BECAUSE of musical literacy. Instead of people that can’t connect what they are playing to what is on the page, they can’t connect what is on the page to the music they want to make. I think that being able to play by ear is extremely important, and without it the whole point of the music goes right over students’ heads for years, until they finally realize that they are doing it all wrong. I think the saddest thing in the classical music world is that students who have been playing for decades and who get into major youth programmes and orchestras cannot improvise with friends after a rehearsal. So for that reason I believe playing by ear is if not of superior importance then most definitely of equal importance to reading musical notation. You wouldn’t teach kids to read books before they can speak.